Lumpia intertwines with a lot of Filipino traditions. Special ones are served during fiestas and celebrations. When feeding the masses is called for, like in religious festivities, lumpia is sure to be one of the dishes served. In its very basic form, it can be made from any assortment of vegetables plucked from people's backyards. 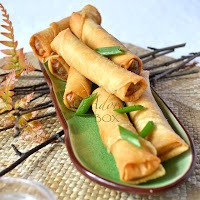 Making lumpia is often a group activity as the amount of slicing required is a bit too much for one person to handle if a big quantity is required. As with most of Filipino vegetable dishes, there are a lot of ingredients. Lumpia is always made in big quantities because no matter how small a batch you mean to make, the numerous ingredients will always add up to a lot. 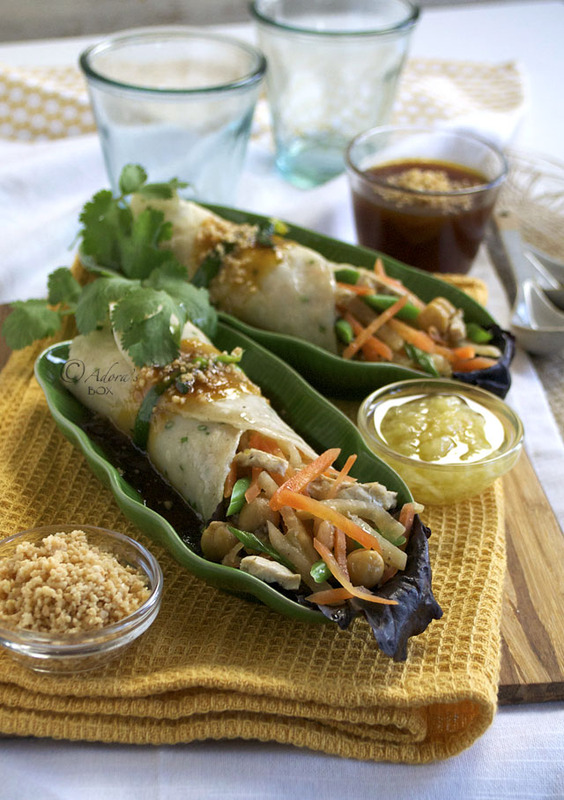 The most commonly used vegetables for lumpia are green papaya, jicama (singkamas), carrots, cabbage, sweet potato, geen beans and heart of palm. Typical of Oriental cuisine, it has pork and shrimps as tastemakers. I prefer chicken to pork as it complements the freshness of the vegetables more (in my opinion). 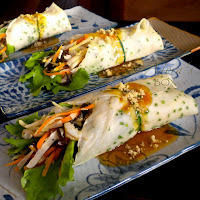 Lumpia is very similar to the Malaysian popiah. 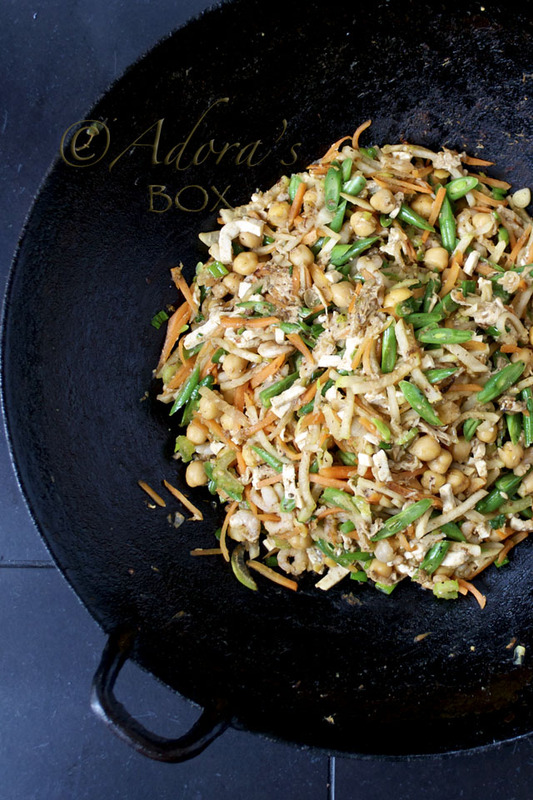 The filling is a basic stir fry of an assortment of vegetables. A soft flour wrapper, lined with fresh lettuce, holds the vegetable mixture. The sauce and the sprinkles make the dish what it is. The sauce, called maalat or paalat (simply meaning salty), is soy sauce based but with a hint of sweetness. Crushed peanuts and crushed garlic are necessary condiments. I like mixing my garlic with bit of oil so it does not dry out. Although the raw garlic provides some level of heat, I think a dash of chilli sauce still is necessary. I cook lumpia as I like it: fresh tasting, vegetables done right and with a lot of garlic (this is not for Twilight fans). The wrappers are different from fried spring roll pastry and are not available where I am so I make my own. Although, this is a side dish, I am happy enough to eat it on its own. 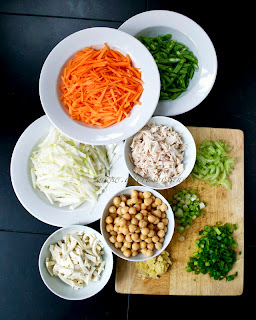 Heat up a wok until very hot then add 1 tbsp. of the oil. Add the carrots and stir fry for 2 minutes. Scoop out onto a plate. Using the same wok, add another 1 tbsp. of oil. Stir fry the turnips for 2 minutes. Scoop out onto a plate. Add another tbsp. of oil to the wok. Add half of the garlic and fry briefly (a few seconds) then add the beans. Stir fry for 2 minutes. Add in the fried carrots, turnips, chick peas, celery the white parts of the spring onions, prawns the sauces (fish, light soy and oyster) and the black pepper. Stir fry for five minutes. You can add water, a tbsp. at a time if the mixture starts to stick. Do not add too much water at once or the vegetables will steam and stew instead of fry. Add the tofu, chicken and the rest of the garlic and stir fry for 2-3 minutes more until the vegetables are crisp tender. Mix the corn flour with 1/4 c of the water. Caramelize the sugar in a pan. Add the rest of the water to the sugar when it becomes dark golden brown in color. Bring to a boil and stir until the sugar melts. Add the corn flour slurry while stirring. When thickened, add the soy sauce. Serve with the lumpia. 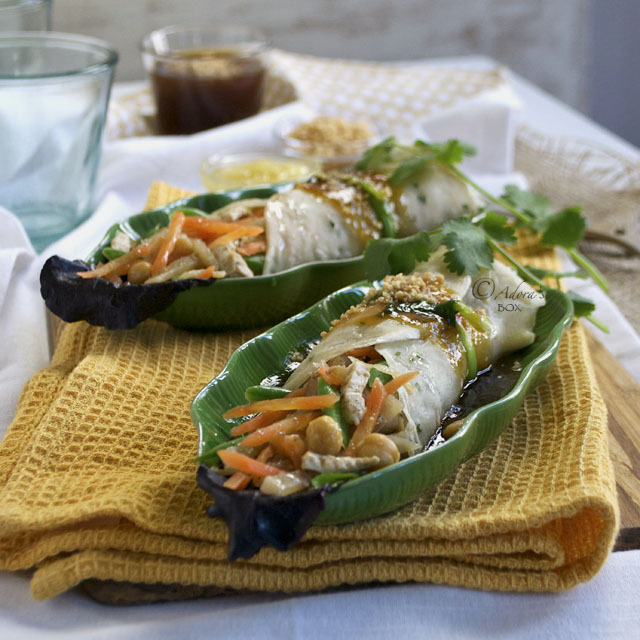 Lay the wrapper on a plate, lay a lettuce leaf on top of it and scoop out 3 generous tbsps. of filling and wrap. 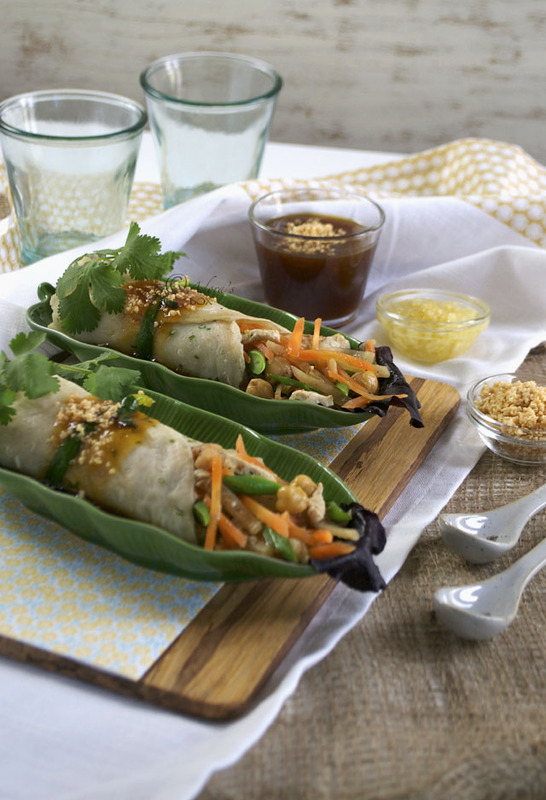 Serve drizzled with the sauce and sprinkled with peanuts. Serve crushed garlic and chilli sauce on the side. Your spring rolls were wrapped up so beautiful and nicely neat. And your presentation looking so impressive! These are so beautiful. I love the chickpeas in the filling and the sweet presentation. Thank you for your comment.. 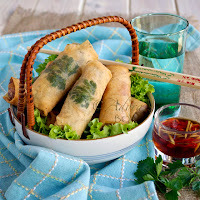 These spring rolls looks delicious!! Wouldn't mind making a batch of these for lunch!!! I just don't know what to say. Of course they are beautiful because your food is ALWAYS beautiful, but the ingredients, the process, the flavors, the wraps and then that sauce! Each of the components of this dish are amazing so I'm sure the result is beyond words. WOW!